After my lovely evening at home alone last week, I went on to celebrate my birthday Friday night with Zach and his girlfriend, Ali (pronounced 'al-lee'), and my honey. It was definitely one of my best birthdays ever. Ali-Maxime Cloutier, poor unsuspecting soul, came into our loves just when we needed her. 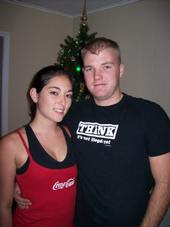 She and Zach started dating a few weeks after he got home from the Marines in August. Little did she know she was entering a wounded war zone. She and Zach hit it off pretty much from the start; they met one fateful night and have been inseparable ever since. She started hanging out at our house right when the tension was getting unbearable between me and Rob (yes, that is grammatically correct) and was actually there the night we decided to get a divorce. The thing is, through all of this, she's never lost her sense of humor and has really helped the rest of us keep things in perspective. The kids love her. Well, really we all love her. It's so nice when God sends people into the fray to help buffer the pain and make us smile again. Thank you Ali, for putting up with the madness and still stickin' around! aaaawwww!!! what cute pictures!!! That's great!! !